A thorough investigation of the neurobiology of HIV-induced neuronal dysfunction and its evolving phenotype in the setting of viral suppression has been limited by the lack of validated small animal models to probe the effects of concomitant low level expression of multiple HIV-1 products in disease-relevant cells in the CNS. We report the results of gene expression profiling of the hippocampus of HIV-1 Tg rats, a rodent model of HIV infection in which multiple HIV-1 proteins are expressed under the control of the viral LTR promoter in disease-relevant cells including microglia and astrocytes. The Gene Set Enrichment Analysis (GSEA) algorithm was used for pathway analysis. Gene expression changes observed are consistent with astrogliosis and microgliosis and include evidence of inflammation and cell proliferation. 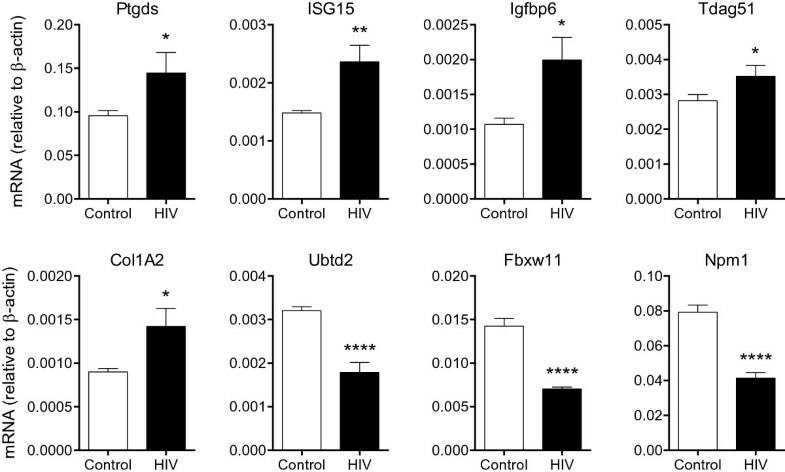 Among the genes with increased expression in HIV-1 Tg rats was the interferon stimulated gene 15 (ISG-15), which was previously shown to be increased in the cerebrospinal fluid (CSF) of HIV patients and to correlate with neuropsychological impairment and neuropathology, and prostaglandin D2 (PGD2) synthase (Ptgds), which has been associated with immune activation and the induction of astrogliosis and microgliosis. GSEA-based pathway analysis highlighted a broad dysregulation of genes involved in neuronal trophism and neurodegenerative disorders. Among the latter are genesets associated with Huntington’s disease, Parkinson’s disease, mitochondrial, peroxisome function, and synaptic trophism and plasticity, such as IGF, ErbB and netrin signaling and the PI3K signal transduction pathway, a mediator of neural plasticity and of a vast array of trophic signals. Additionally, gene expression analyses also show altered lipid metabolism and peroxisomes dysfunction. Supporting the functional significance of these gene expression alterations, HIV-1 Tg rats showed working memory impairments in spontaneous alternation behavior in the T-Maze, a paradigm sensitive to prefrontal cortex and hippocampal function. Altogether, differentially regulated genes and pathway analysis identify specific pathways that can be targeted therapeutically to increase trophic support, e.g. IGF, ErbB and netrin signaling, and reduce neuroinflammation, e.g. PGD2 synthesis, which may be beneficial in the treatment of chronic forms of HIV-associated neurocognitive disorders in the setting of viral suppression. HIV-associated dementia, opportunistic infections and neoplasms are significantly reduced since the introduction of combination antiretroviral therapy (cART) [1–4]. However, decreased HIV-associated dementia has been associated with an increased prevalence of milder and chronic forms of HIV-associated neurocognitive disorders (HAND) and HIV-associated major depressive disorder along with increased life expectancy [4–10]. Release of HIV proteins and cytokine/chemokines from monocytes/macrophages into the CNS parenchyma plays a central role in HIV-associated neurological disorders [11, 12]. Several HIV-1 proteins also possess neurotoxic potential including gp41, Vpr, Nef, Rev and Vpu [13–16]. Evidence suggests that the toxic actions of low levels of HIV-1 products are key in the neuropathogenesis of persistent central nervous system HIV disease in the setting of cART. In fact, after the introduction of cART, HAND do not correlate with indicators of florid HIV replication such as plasma viral load and low CD4+ counts , but are correlated with synaptodendritic injury [17, 18], which in experimental settings can be induced by HIV-1 products even in the absence of virus replication [19–21]. Therefore, there is a need to investigate the pathologic consequences of the expression of low levels of multiple HIV-1 proteins in disease relevant cell types. The HIV-1 transgenic (Tg) rats used in the present study harbor a gag/pol-deleted HIV-1 provirus under the LTR promoter , resulting in the co-expression of multiple HIV-1 proteins in disease-relevant central nervous system (CNS) cells such as microglia and astrocytes, but not in neurons [22, 23]. Thus, the HIV-1 Tg rats differ from most other non-replicating small animal models expressing a single HIV-1 protein and from replicating models . The construct used in HIV-1 Tg rats was previously used in mice where it was characterized by ectopic expression , possibly because of deficient interaction of Tat with the murine cyclin T . Despite lack of virus replication and production, HIV-1 Tg rats have a progressive clinical presentation leading to a picture reminiscent of some of AIDS features later in life that includes immunological abnormalities and neurological manifestations [22, 27]. Here we studied global gene expression in the hippocampus of HIV-1 Tg rats before the appearance of overt symptomology to model the effects of concomitant expression of low levels of multiple HIV-1 products in the CNS in the absence of viral replication, as seen in the context of viral suppression in the setting of combination antiretroviral therapy (cART). Results show that HIV-1 Tg rats have gene expression changes reminiscent of neuroAIDS, significant astrogliosis and microgliosis, and working memory impairments. We used the Gene Set Enrichment Analysis (GSEA) algorithm  to identify molecular pathways that are differentially activated in HIV-1 Tg rats. We observed dysregulation of pathways associated with gliosis, consistent with the morphological results in HIV-1 Tg rats, reduced trophic support and synaptic plasticity, mitochondrial function, as well as neurodegenerative diseases such as Huntington’s disease and Parkinson’s disease. HIV-1 Tg rats showed working memory impairments in spontaneous alternation behavior in the T-Maze, a paradigm sensitive to prefrontal cortex and hippocampal function, supporting the functional significance of the gene expression changes observed. Characterization of the neuropathological alterations in the HIV-1 Tg rat was performed with antibodies against the astroglial marker GFAP and the microglial cell marker Iba1. Expression of HIV-1 proteins in the hippocampi of HIV-1 Tg rats was observed in both microglia and astrocytes (Figure 1). As expected in the control animals, scattered astroglial cells were detected in the neocortex and more active astroglia was observed in the adjacent white matter and hippocampus (Figures 1 and 2). 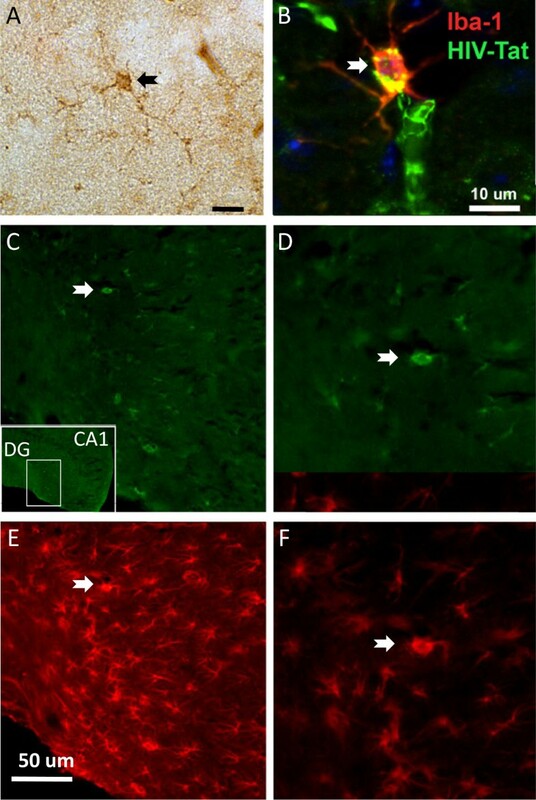 In contrast, in HIV-1 Tg rats, levels of astrogliosis in the neocortex and hippocampus were significantly increased with the presence of enlarged astroglia with distended cytoplasm (Figure 2A). Likewise, in control rats, moderate numbers of microglial cells were detected in the neocortex and hippocampus, in contrast in the HIV-1 Tg animals there was an increase in Iba1 positive microglial cells that was more prominent in the hippocampus than in the neocortex (Figure 2C). These cells displayed abundant branches and processes and the cytoplasm was distended, suggesting the possibility of an activated state. Significant astrogliosis and microgliosis were observed by immunostaining in the hippocampi of HIV-1 Tg rats (Figure 2B, D). Quantitative reverse transcriptase polymerase chain reaction (RT-PCR) confirmed that the expression of astrogliosis and microgliosis markers was increased in the hippocampus of HIV-1 Tg rats (Figure 3). Expression of HIV-1 products in HIV-1 Tg rats. A) HIV protein Tat was detected by immunohistochemistry with peroxydase detection in the hippocampus in cells with microglia morphology (arrow) and B) by immunofluorescence with double labeling of HIV-1 Tat and the microglia marker Ionized calcium binding adaptor molecule 1 (Iba-1) (arrow). C-F) Double immunofluorescence for HIV-1 gp120 (C-D) and for the astrocytic marker glial fibrillary acidic protein (GFAP) (E-F) in the hippocampus of HIV-1 Tg rats revealed gp120-immunoreactive astrocytes (arrow). The location of the field shown in C-F is indicated by the inset in C.
Astrogliosis and microgliosis in the brain of HIV-1 Tg rats. A) Immunostaining for the astrocytic marker GFAP in HIV-1 Tg and control rats. The panel to the left is a low power view (4X) of the neocortex and hippocampus, while the panels in the middle and right are at higher magnification (400X) (B) Computer aided image analysis of the numbers of GFAP positive cells in the neocortex and hippocampus demonstrate a significant increase in astroglial cells in the HIV-1 tg rats (Student’s t-test). C) Immunostaining for the microglial marker Iba-1 in HIV-1 Tg and control rats. The panel to the left is a low power view (4X) of the neocortex and hippocampus, while the panels in the middle and right are at higher magnification (400X); D) Computer aided image analysis of the numbers of Iba-1 positive cells in the neocortex and hippocampus demonstrate a significant increase in astroglial cells in the HIV-1 Tg rats (* = p < 0.01; n = 6, by t-test). Bar = 250 and 25 μm at 4X and 400x, respectively. RT-PCR validation of increased expression of astrogliosis and microgliosis markers in the hippocampus of HIV-1 Tg rats. The mRNA for the astrocytic marker GFAP, and the microglia markers Iba-1 and CD11b (Mac1) were significantly increased in HIV-1 Tg rats over controls, consistent with the immunohistochemistry results in Figure 2 (n = 6, **p < 0.01, ****p < 0.0001, by t-test). Gene expression was profiled in the hippocampi of HIV-1 Tg and wild-type rats with high-density Affymetrix arrays (Figures 4 and 5, Additional files 1 and 2: Tables S1 and S2). Pathway analysis with the GSEA algorithm  revealed 23 pathways significantly differentially regulated with statistical significance of p ≤ 0.01 (Figures 6 and 7, Additional file 3: Table S3). Eight differentially regulated pathways showed increased activation, while the rest was decreased. Hierarchical clustering of top differentially expressed genes in the hippocampus of HIV-1 Tg rats (HIV) versus wild-type littermate controls (Control). Gene expression was profiled in the hippocampi of HIV-1 and wild-type rats with high-density Affymetrix microarrays. The dendrogram shows 73 of the top 100 differentially expressed probesets that were found to be associated with gene names (Additional file 3: Table S3). Genes are colored according to their expression values. Red indicates upregulated genes in HIV-1 Tg rats, while blue indicates downregulated genes. Brightness is proportional to the extent of change in gene expression. RT-PCR validation of differentially expressed genes in the hippocampus of HIV-1 Tg rats. Examples of genes that were found to be differentially regulated in the hippocamous of HIV-1 Tg rats include PGD2 synthase (Ptgds), interferon stimulated gene ISG-15 (ISG-15), IGF binding protein 6 (Igfbp6) and the IGF-activated gene T cell death-associated gene 51 (TDAG51), Col1A2 (procollagen type1-a2), and the mitochondrial protein ubiquitin domain containing 2 (Ubtd2). Lastly, among differentially expressed genes are Fbxw11 and Npm1, which interact with HIV-1 proteins Vpu and Tat, respectively. Please see text (n = 6, *p < 0.05, **p < 0.01, ***p < 0.001, ****p < 0.0001, by t-test). Top 23 differentially regulated pathways in the hippocampus of HIV-1 Tg rats and controls by GSEA. The Gene Set Enrichment Analysis (GSEA) algorithm was used for pathway analysis using the MSigDB C2 canonical pathway collection . Of the significantly differentially regulated pathways with statistical significance of p ≤ 0.01, 8 showed increased activation, while the rest was decreased. Among the increased ones are pathways consistent with astrocyte and microglia activation, inflammatory processes, and interferon activation. Decreased pathways indicate substantial downregulation of signaling systems involved in neuronal trophism and synaptic synaptic function. Pathways are colored according to their expression values: red indicates upregulated genes in HIV-1 Tg rats, while blue indicates downregulated pathways. Brightness is proportional to the extent of change in pathway expression. GSEA plots of selected differentially regulated pathways. Representative differentially regulated pathways are shown including pathways with increased and reduced activation in the hippocampus of HIV-1 Tg rats. Pathways with increased activation included pathways indicative of (A) interferon activation; (B, C) cell division, consistent with astrogliosis and microgliosis; (D) peroxisome dysregulation. Pathways with reduced activation (E-H) are indicative of reduced neuronal trophism and neurodegeneration. 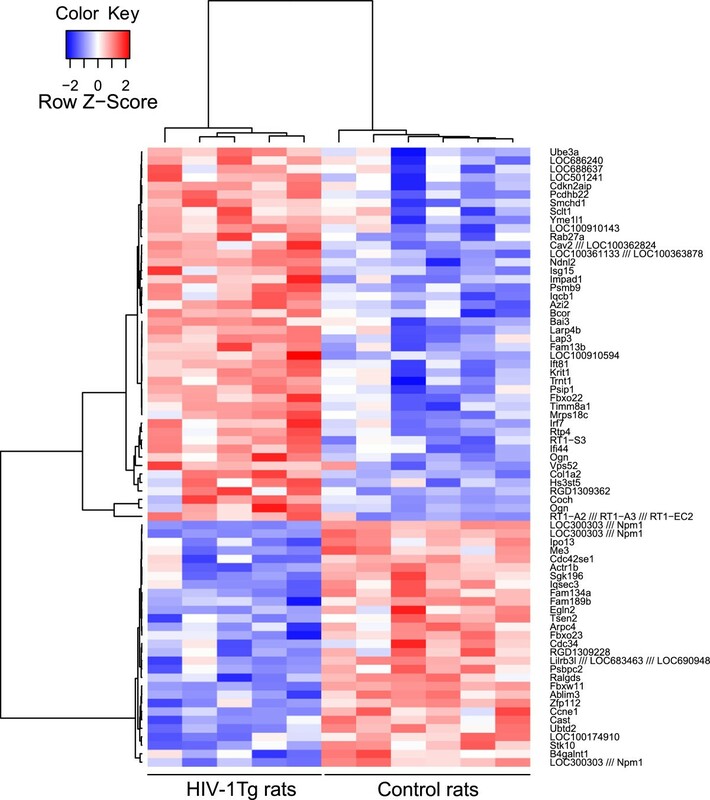 Results show that among the pathways and genes differentially expressed, several are consistent with astrocyte and microglia activation and inflammatory processes (Figures 2 and 3, Additional file 3: Table S3). In particular, pathways showing significant activation included 4 pathways indicative of DNA synthesis and cell proliferation, suggestive of astrocyte and microglia activation (“REACTOME_SYNTHESIS_OF_DNA” and “REACTOME_MITOTIC_G1_G1_S_PHASES”, “REACTOME_CDT1_ASSOCIATION_WITH_THE_CDC6_ORC_ORIGIN_COMPLEX” and “REACTOME_RNA_POL_I_TRANSCRIPTION_TERMINATION”, MSigDB geneset denomination; Figures 4 and 7, Additional file 3: Table S3). Two pathways indicative of interferon activation were also increased (“REACTOME_INTERFERON_SIGNALING” and “REACTOME_INTERFERON_ALPHA_BETA_SIGNALING”) (Figures 5 and 6, Additional file 3: Table S3). Among the interferon-related genes that were found to be increased in HIV-1 Tg rats is the interferon stimulated gene 15 (ISG-15) (Figure 5, Additional file 1: Table S1). Other inflammation- and astrogliosis-related genes increased in the hippocampi of HIV-1 Tg rats include prostaglandin D2 (PGD2) synthase (Ptgds) and procollagen type1-a2 (Col1A2) (Figure 5, Additional file 1: Tables 1). The GSEA analysis highlights a substantial downregulation of intracellular signaling pathways relevant to trophic support. In particular, the PI3K-mTOR signaling pathway (“PID_MTOR_4PATHWAY”), the LKB1 pathway (“PID_LKB1_PATHWAY”), and the integrin-linked kinase (ILK) pathway (“PID_ILK_PATHWAY”), were downregulated (Figures 6 and 7, Additional file 3: Table S3). Various downregulated genesets also contain numerous MAP kinases (PID_MTOR_4PATHWAY; REACTOME_AXON_GUIDANCE; PID_PRLSIGNALINGEVENTSPATHWAY; REACTOME_L1CAM_INTERACTIONS; REACTOME_SIGNALING_BY_ERBB2; REACTOME_DOWNREGULATION_OF_ERBB2_ERBB3_SIGNALING”, “PID_ILK_PATHWAY”), such as ERK1 (MAPK3). GSEA also showed downregulation of genesets related to neuronal function and synaptic plasticity such as “REACTOME_NEURONAL_SYSTEM” and “REACTOME_AXON_GUIDANCE” (Figures 6 and 7, Additional file 3: Table S3), which appears consistent with the reduced trophic tone suggested by the data. GSEA pathway analysis also indicates that key roles in the downregulation of transduction pathways mediating trophic signals may be played by the insulin-like growth factor (IGF), Erb-neuregulin-1 (NRG1) and netrin systems. In particular, IGF binding proteins 2 and 6 (Igfbp2 and Igfbp6) and the IGF-activated gene T cell death-associated gene 51 (TDAG51), also known as pleckstrin homology-like domain family A member 1 (PHLDA), were differentially regulated in HIV-1 Tg rats (Figure 5, Additional file 1: Table S1) as was the IGF signaling pathways by GSEA (REACTOME_REGULATION_OF_INSULIN_LIKE_GROWTH_FACTOR_IGF_ACTIVITY_BY_INSULIN_LIKE_GROWTH_FACTOR_BINDING_PROTEINS_IGFBPS). GSEA also showed differential regulation of Erb-neuregulin-NRG1 and netrin signaling pathways (“REACTOME_SIGNALING_BY_ERBB2”, “REACTOME_DOWNREGULATION_OF_ERBB2_ERBB3_SIGNALING”, and “REACTOME_NETRIN1_SIGNALING”; Figures 6 and 7, Additional file 3: Table S3). Pathways related to neurodegeneration associated with protein misfolding and mitochondrial dysfunction were differentially regulated including “KEGG_PARKINSONS_DISEASE” and “KEGG_HUNTINGTONS_DISEASE”. Another significantly dysregulated pathway is the “REACTOME_CALNEXIN_CALRETICULIN_CYCLE”, which involves unfolded protein response genes. Multiple genesets are indicative of dysregulation of phospholipid metabolism (“EGG_GLYCEROPHOSPHOLIPID_METABOLISM”, “KEGG_GLYCEROLIPID_METABOLISM” and “KEGG_PEROXISOME”; Figures 6 and 7, Additional file 3: Table S3). Lastly, two cellular targets of HIV-1 were differentially regulated in the hippocampus of HIV-1 Tg rats, Fbxw11 and the nuclear chaperone nucleophosmin/B23 encoded by the Npm1 gene (Figure 5 and Additional file 1: Table S1). To determine the functional correlates of the present gene expression and pathologic findings, we then investigated working memory in HIV-1 Tg rats using a hippocampus and prefrontal cortex-dependent task [29–32]. Rats were tested in the dark in spontaneous alternations in the T-Maze, which is a paradigm sensitive to prefrontal cortex and hippocampal impairments [29–32]. Visual cues were not provided in the T-Maze paradigm, as done by others , to minimize the influence of cataracts in HIV-1 Tg rats. HIV-1 Tg rats exhibited a marked decrease of alternation behavior (SAB) compared to control rats (t10 = 4.2, p < 0.01) (Figure 8A). Only the control rats alternated significantly above chance (t6 = 7.1, p < 0.001) whereas HIV-1 Tg rats were not significantly different from chance level (t4 = 1.2, p = ns). There was no difference between the two groups in the latency to leave the start box or the latency to make a choice (Figure 8B). Finally there was no difference between the two groups in the number of failed trials or in the response bias (Control: 0.55 ± 0.02; HIV-1 Tg: 0.58 ± 0.04, p = ns). These results indicate an impairment of hippocampal working memory in HIV-1 Tg rats that was not a consequence of an increase of anxiety-related behavior since we did not see increases in the latency to leave the start box or in the number of failed trials in HIV-1 Tg rats. Moreover this alteration of working memory is unlikely to come from an increase in the delay between the encoding and the recall of information or an alteration of locomotor activity since the latency to start and the latency to enter the arm were similar in both groups. Thus, the gene expression changes observed above are associated with neurocognitive impairments in HIV-1 Tg rats. 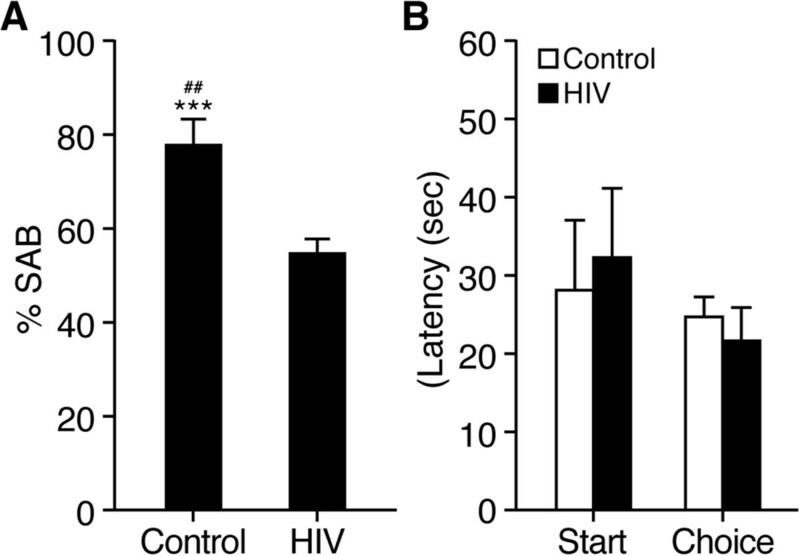 Working memory impairment in HIV-1 Tg rats. Working memory was significantly impaired in adult (4–5 months old) HIV-1 Tg rats compared to wild-type controls (CONT) using the spontaneous alternation behavior in the T-Maze, a paradigm sensitive to prefrontal cortex and hippocampal impairments. A) HIV-1 Tg rats exhibited a marked decrease of spontaneous alternation behavior (SAB), a measure of working memory, compared to control rats (n = 7 for both groups; t10 = 4.2, p < 0.01). Only the control rats alternated significantly above chance (t6 = 7.1, p < 0.001) whereas HIV-1 Tg rats were not significantly different from chance level (t4 = 1.2, p = ns). There was no difference between the two groups in the latency to leave the start box or the latency to make a choice (B). ***p < 0.001 vs. chance; p < 0.01 vs. HIV-1 Tg rats. A thorough neurobiological investigation of the neurobiology of HIV-induced neuronal dysfunction and its evolving phenotype in the context of viral suppression has been limited by the lack of validated small animal models to probe the effects of concomitant low level expression of multiple HIV-1 products in disease-relevant cells in the CNS. The HIV-1 Tg rats are constitutive, making them a model of persistent exposure to viral proteins, although lack of induciblity of the HIV-1 provirus can be seen as a limitation. Here we show that HIV-1 Tg rats express viral proteins in microglia and astrocytes, display astrogliosis and microgliosis, and have gene expression changes consistent with human neuroAIDS. Collectively, these results support that HIV-1 Tg rats are a valid animal model of neuroAIDS. Supporting the functional significance of the gene expression alterations reported here, HIV-1 Tg rats showed working memory impairments in spontaneous alternation behavior (SAB) in the T-Maze, a paradigm sensitive to prefrontal cortex and hippocampal function. Rats were tested in the dark in the T-Maze with no visual cues provided to minimize the influence of cataracts in HIV-1 Tg rats, as done by others . In this regard it should be noted that spontaneous alternation behavior (SAB) has been used in aged rats with visual impairments  and to compare anophthalmic mutant mice to wild-type controls . It has been previously shown that HIV transgenic rats exhibit impairment in a spatial reversal learning task  without any deficit in spatial memory or motor activity . Our results extend these studies by showing that HIV rats also exhibit impairment in a working memory task. The deficits in the reversal learning task and the working memory task may both be explained by an impairment in the ability of HIV rats to shift attention to a new target, a decreased working memory capacity and/or an increase in perseveration. Gene expression and pathway analysis with the GSEA algorithm show evidence of neuroinflammatory processes and gliosis and synaptodendritic injury that together with the impairment in working memory are reminiscent of HAND in humans. In particular, the GSEA-based pathway analysis that we employed suggests key dysregulation in IFN regulated pathways, including ISG-15, which exerts antiviral activities through members of the Endosomal sorting complex required for transport (ESCRT) proteins . ISG-15 was proposed to be a predictive biomarker for HAND [39, 40]. In particular, ISG-15 was shown to correlate with neuropathology and viral load and ISG-15 CSF levels may be predictive of future neurocognitive impairments . Several other inflammation-related genes induced in the hippocampus of HIV-1 Tg rats were previously associated with neuroAIDS in humans including IGF binding proteins , prostaglandin D2 (PGD2) synthase , and the pro-alpha2 chain of type I collagen, Col1A2 . Prostaglandins have been implicated in inflammation-induced working memory deficits  and imaging evidence supports that brain arachidonic acid metabolism in HIV-1 transgenic rats is upregulated . PGD2 has been implicated in the induction of astrogliosis and demyelination [42, 46] and has been associated with immune activation, astrogliosis, microgliosis, and neuroAIDS in humans . Col1A2 has been associated with neuroAIDS in humans . Collagen induction in the CNS has been also observed in brain injury, Alzheimer’s disease, temporal lobe epilepsy, and multiple sclerosis plaques [47–49]. GSEA analysis showed downregulation of genesets related to neuronal function, neuronal trophism, synaptic plasticity, as well as genes and pathways associated with degenerative diseases such as Huntington’s disease and Parkinson’s disease, which include genes involved in protein misfolding and mitochondrial function. Decreased expression of synaptic plasticity and axon guidance genes was also observed in patients with HIVE in the The National NeuroAIDS Tissue Consortium Brain Gene Array  and in another study , consistent with the notion that HAND in the cART setting correlates with synaptodendritic injury [17, 18]. Dysregulations of genes related to Parkinson’s disease and Huntington’s disease and mitochondrial function, is consistent with previous studies suggesting mitochondrial dysfunction and oxidative stress as potential contributors to HAND . Signaling systems involved in neuronal trophism and synaptic maturation and plasticity that were found to be differentially regulated in HIV-1 Tg rats involve IGF, ErbB and netrin, all of which have been shown to exert trophic actions on dendritic spines [52–55], suggesting that dysregulation of these pathways can contribute to the synaptodendritic injury seen in neuroAIDS [17, 18]. IGF signaling has been implicated in synaptic trophism, depression and Parkinson’s disease [55–57]. GSEA highlighted differential expression of IGF signaling genes including increased Igfbp2 and Igfbp6 expression, which were also found to be increased in the CSF of HIV-1 patients . The IGFBPs have high affinities for the IGFs [58, 59] and their increased expression may result in reduced trophic support as well as inflammatory processes [60–62]. The IGF activated gene TDAG51/PHLDA1 , which is expressed in both neurons and glial cells , is implicated in insulin signaling  and has been shown to have differential effects on susceptibility to apoptosis [66–68]. ErbB2/B4 receptors and their ligand neuregulin-1 (NRG1) are encoded by candidate susceptibility genes for schizophrenia . Functional NRG1 receptors consist of ErbB4 homodimers or heterodimers between ErbB2, ErbB3 and ErbB4 since NRG1 binds ErbB3 and ErbB4, and ErbB2 and ErbB4 have intrinsic tyrosine kinase activity . Mice that lack the ErbBs with intrinsic tyrosine kinase activity (ErbB2 and ErbB4) in the CNS have reduced dendritic spine density and behavioral abnormalities , possibly implicating this ErbB signaling in synaptodendritic injury. Netrins are secreted mediators that exert multiple trophic actions including axon guidance , synaptic plasticity , prevention of apoptosis [72, 73], adult neurogenesis including in the course of CNS regeneration [74–76], which is believed to be impaired in neuroAIDS , and synaptic trophism . The GSEA analysis highlights a substantial downregulation of intracellular signaling pathways relevant to trophic support such as the PI3K-mTOR signaling pathway, which mediates a vast array of trophic signals ; the LKB1 pathway, which is key to neuronal survival following mitochondrial insults  and cross-talks with the PI3K-mTOR pathway; and the ILK pathway, which is involved in mediating trophic signals of the extracellular matrix and trophic factors as well as in the anti-apoptotic effect of the PI3K pathway . Recent studies have indicated impaired processing and transport of neurotrophic factors in HIV-1 neuropathogenesis [81–83]. The PI3K-mTOR signaling pathway is involved in synaptic plasticity [84–86] and was shown to be dysregulated in the frontal cortex of patients with neuroAIDS . Downregulated genesets also contain numerous MAP kinases including ERK1 (MAPK3), which was previously implicated in the neurological actions of HIV-1 products . The GSEA analysis also points to coordinated mitochondria and peroxisome dysregulations as well as dysregulation of phospholipid metabolism. Peroxisomes and mitochondria exhibit a functional interplay in fatty acid processing and intermediate metabolism [88, 89]. It could be envisioned that if peroxisomal metabolism is slowed, critical metabolic intermediates (e.g., acetyl-CoA) may not be adequately supplied to mitochondria and, conversely, disruption of mitochondrial metabolism can similarly affect peroxisomal function. Peroxisome dysfunction may also contribute to increased lipid peroxidation and cellular aging in HIV-1 [90, 91]. In apparent agreement with the dysregulation of these pathways, evidence suggestive of altered phospholipid metabolism has been reported in HIV-1 patients [92, 93] and peroxisome dysregulation can be indicative of altered brain oxidative balance associated with HIV-1 . Two cellular targets of HIV-1, Fbxw11 and nucleophosmin/B23, were also differentially regulated in the hippocampus of HIV-1 Tg rats. Fbxw11 is the gene coding for βTrCP, a cellular ubiquitin ligase that was found to be bound by the HIV-1 Vpu viral protein . Nucleophosmin/B23, encoded by the Npm1 gene, is a nuclear chaperone implicated in the nuclear transport of Tat . Gene expression analysis can be a useful tool both to gain insights in the pathogenesis and for the identification of potential new therapeutic targets by identifying the signaling pathways that have the potential to modify the disease pathophysiology [97–99]. This is especially needed in neuroAIDS as no targeted therapy other than cART is currently recommended for the management of HAND [100, 101]. Adjunctive therapies for HAND explored to date include the low-affinity antagonist of the NMDA type glutamate receptor memantine, the calcium channel blocker nimodipine, and the monoamine oxidase B inhibitor selegiline, in addition to antioxidants and anti-inflammatory drugs such as minocycline. Memantine and nimodipine are intended to protect from excitotoxic neuronal damage associated with excessive glutamate release [102, 103]. Selegiline is a drug used for the treatment of early-stage Parkinson’s disease, depression and dementia [104, 105]. Our gene expression results showing decreased expression of Parkinson's disease-related genesets lend support for the use of selegiline in HAND and potentially for other therapeutics used in Parkinson's disease such as methylphenidate, a stimulant that reduces reuptake of dopamine and norepinephrine that has proven beneficial in lowering fatigue scores in HIV patients . The present results of increased PGD2 synthase (Ptgds), is in keeping with previous studies that showed elevated PGD2 levels in HIV-1-positive patients . A potential role of prostaglandins in HIV-1 neuropathogenesis is also indicated by increased expression of the prostaglandin synthetic enzyme COX-2, which is also a characteristic of other degenerative conditions such as Alzheimer's disease and amyotrophic lateral sclerosis [107, 108]. Dysregulation of prostaglandin synthesis in HAND lends support to the use of inhibitors of cyclooxygenase-2 (COX-2) as well as newer compounds targeting the PGD2 receptor. In this regard, a COX-2 inhibitor has shown promise in downregulating immune activation and improving T cell function in HIV-1 patients . The present gene expression results as well as the previous literature also point to a role in HAND of several signaling systems with the potential to provide trophic support to synapses and reverse the synaptodendritic injury associated with HAND [17, 18]. Among them are IGF, ErbB and netrin signaling and the PI3K-mTOR signal transduction pathway, which mediates trophic and plastic actions of various signaling systems. IGF-1 therapy has shown potential in models of both Parkinson’s disease [110, 111] and Alzheimer's disease [112, 113]. These effects are at least in part mediated by recruitment of PI3K [111, 114]. Additionally, chronic treatment with IGF-1 was protective in vitro against gp120-mediated neuronal damage and was synergistic with erythropoietin (EPO), at least in part, through cooperative activation of PI3K . 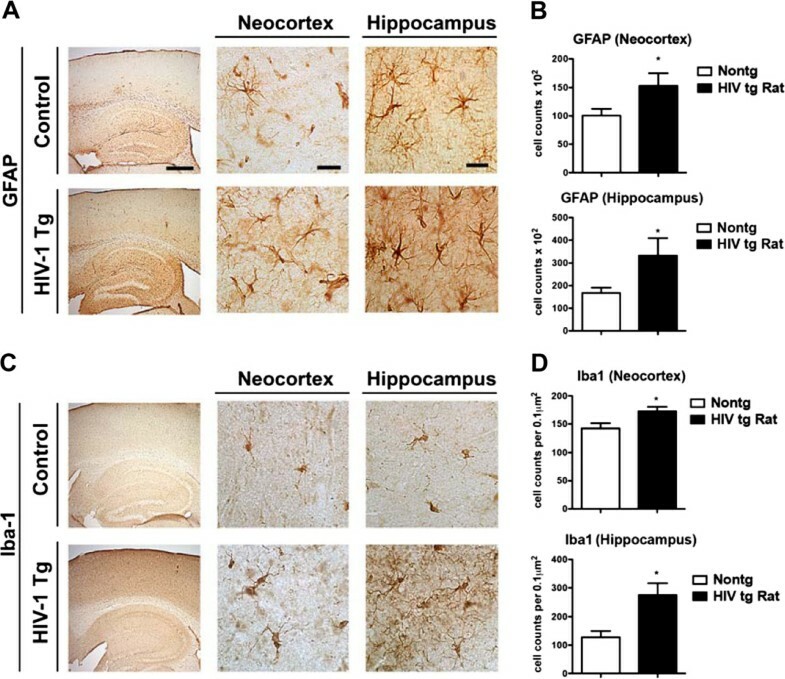 GLP-1 and GLP-1 analogs, which activate partially overlapping signal transduction pathways as insulin and IGF-1 , have also shown beneficial effects in preclinical models of neurodegenerative disorders [116–119]. There is currently great interest in developing drugs to modulate NRG1–ErbB4 and netrin signalling [120, 121]. Netrin agonists may be potentially beneficial in neuroAIDS both by exerting neurotrophic actions and by reducing inflammation . The PI3K pathway is itself a potential target for reversal of the synaptodendritic injury associated with HAND. However, as PI3K appears to play a role in the regulation of the HIV-1 LTR promoter and virus latency [122, 123], activation of PI3K in the cells that harbor the provirus may increase levels of expression of HIV-1 products, potentially leading to detrimental effects on cognition. The investigation of HIV-induced CNS dysfunction in the context of viral suppression has been limited by the lack of validated small animal models with low level expression of multiple HIV-1 proteins in disease-relevant cells. Here we show that HIV-1 Tg rats express viral proteins in microglia and astrocytes and display astrogliosis and microgliosis and show gene expression changes that are reminiscent of HIV-1 infection in humans. Differentially regulated genes and pathway analysis also identify specific pathways that can be targeted therapeutically to increase trophic support and reduce neuroinflammation that may be beneficial in the treatment of chronic forms of HAND in the setting of cART. HIV-1 Tg and wild-type rats 4–5 months of age (Harlan Sprague–Dawley) were used for the study. For immunohistochemistry animals were perfused under deep isofluorane anesthesia with 4% paraformaldehyde in phosphate buffer; for microarray analyses, animals were sacrificed under deep isofluorane anesthesia and hippocampi were quickly removed and processed for RNA extraction. Brains were post-fixed in phosphate-buffered 4% paraformaldehyde at 4°C for 48 hrs and sectioned in the saggital plane at 40 μm with a Vibratome 2000 (Leica). Briefly as previously described  saggital brain vibratome sections from the non-Tg and HIV-1 Tg rats were incubated overnight at 4°C with the rabbit polyclonal antibodies against Tat (NIH AIDS reagent program; cat# 1974) or mouse monoclonal antibodies against the astroglial marker - glial fibrillary acidic protein (GFAP, Millipore), or a monoclonal antibody against the microglial marker Iba-1 (1:1000, Sigma-Aldrich, Saint Louis, MO). Primary antibody incubation was followed by incubation with secondary biotinylated IgG, then avidin-HRP and diaminobenzidine (DAB) detection. All sections were processed under the same standardized conditions. Immunostained sections were imaged with a digital Olympus microscope and assessment of levels of Tat, GFAP and Iba-1 immunoreactivity was performed utilizing the Image-Pro Plus program (Media Cybernetics, Silver Spring, MD). For each case a total of three sections (10 digital images per section at 400x) were analyzed in order to estimate the average number of immunolabeled cells per unit area (mm2) and the average intensity of the immunostaining (corrected optical density). All slides were processed simultaneously under the same conditions and experiments were performed in triplicate to assess the reproducibility of results. To determine the co-localization between HIV-1 proteins and astroglial and microglial cells, double-labeling experiments were performed, as previously described. For this purpose, vibratome sections were immunolabeled with the rabbit polyclonal antibody against human Tat or gp120 (NIH AIDS reagent program) and the mouse monoclonal antibodies against GFAP (Millipore) and Iba-1 (Wako). Double-immunocytochemical analysis was performed utilizing the Tyramide Signal Amplification™-Direct (Red) system (NEN Life Sciences, Boston, MA) to detect Iba-1 or GFAP and fluorescein isothiocyanate (FITC)-conjugated secondary antibodies (1:75, Vector) to detect Tat or gp120. Sections were imaged with a laser scanning confocal microscope BioRad Radiance 2000 (Hercules, CA) equipped with a Nikon E600FN Ellipse microscope (Japan) and using a Nikon Plan Apo 60x oil objective (NA 1.4; oil immersion). Statistical significance of differences in the expression of GFAP and Iba-1 between HIV-1 Tg rats and controls was determined by unpaired Student’s t-test. Processing of Affymetrix microarrays was carried out as previously described, according to manufacturer’s procedures [125, 126]. All analyses were performed with R statistical software. We analyzed 11 samples (5 HIV-1 Tg rats; 6 controls) hybridized on Affymetrix Rat 230.2. One additional HIV sample was removed as it showed lower quality than the other samples. Differential expression was computed with functions from the package limma and takes into account sample phenotype and batch. False Discovery Rates were computed by Benjamini & Hochberg method. 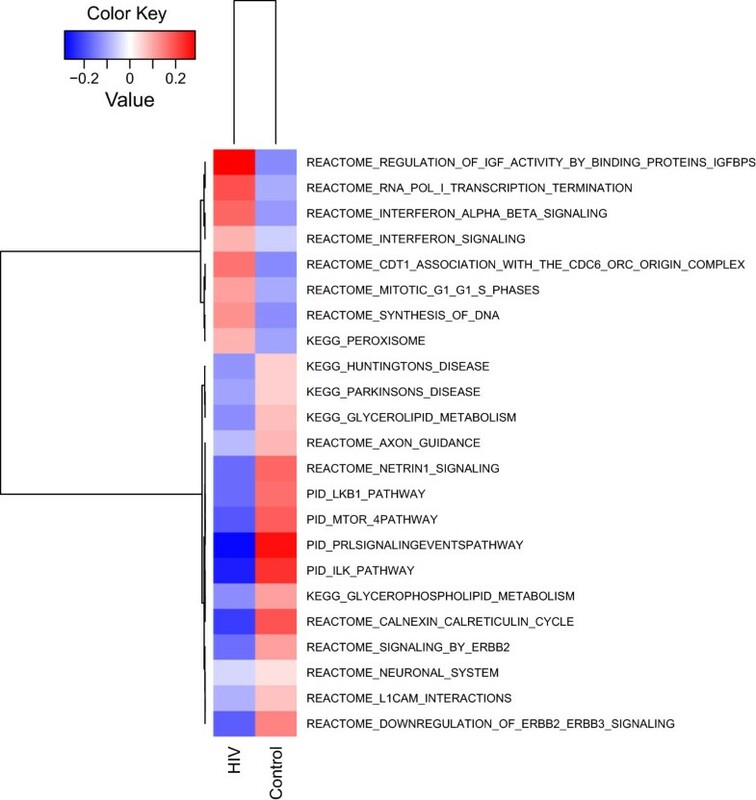 Differential expression between HIV-1 and control rats identifies 614 and 4 probes differentially expressed at p-value < 0.01 and FDR < 0.05, respectively. Pathways for GSEA analysis were from the MSigDb collection C2 that contains major pathway databases including KEGG, REACTOME and PID (http://www.broadinstitute.org/gsea/msigdb/index.jsp). We “humanized” the rat gene expression profiles by first selecting one probe per gene (the one with the highest coefficient of variation) and then kept the genes that had a unique human homologous gene (according to the database Homologene http://www.ncbi.nlm.nih.gov/homologene) for pathway analysis. Pathway differential activity was performed with GSEA using t-statistics obtained from the limma test as the reference list and pathway members as genesets; 24 pathways showed a p-value < 0.01. We report the pathways with the MSigDB terminology in the text and figures. RT-PCR was carried out as previously described [125, 127, 128] with SYBR Green (BioRad) detection using an iQ5 Real-Time PCR Detection System (BioRad, Hercules, CA). The relative amounts of target mRNA were determined by the ΔCt method using β-actin for normalization . Statistical significance of differences between HIV-1 Tg rats and controls was determined by unpaired Student’s t-test. Rats were tested in the dark (<20 lux) during the nocturnal period using two identical T-Mazes constructed of black Plexiglas with no visual cues provided to minimize the influence of cataracts in HIV-1 Tg rats, as done by others . Rats were first habituated to the experimenters over 4 days (5 min/day) as described in  and . On test day, rats were allowed to alternate between the left and right goal arms of the T-maze in 15 trial sessions. Each session consisted of 1 forced trial followed by 14 free choice trials. Once the rat entered a particular goal arm (4 paws inside), a guillotine door was lowered to block entry to the opposite arm. The door was removed only after the rat returned to the start arm, thus allowing a new alternation trial to be started. If the rat did not enter one of the two arms after 120 seconds, the rat was placed in the previously chosen arm and the trial was considered as failed. If after 30 seconds the rat did not spontaneously return to the start box, the experimenter manually positioned the rat in the start box for the next trial. The spontaneous alternation behavior (SAB) and the response bias were calculated with the formula below where n = number of choices, na’ = number of non-alternation responses, ρR2 = probability of a right turn, ρL2 = probability of a left turn . The response bias corresponds to the tendency of an animal to favor one side over the other. The values of the response bias vary from 0.5 (no bias or same number of left and right choices) to 1.0 (full bias or exclusive left or right choices). Because animals with high response bias automatically exhibit low SAB that may be independent of any cognitive deficits, calculation of SAB without integrating the response bias may lead to wrong interpretations of the results by artificially producing low values below chance level. The formula was established so that a response bias of 0.5 (no bias) does not affect the calculation of SAB while a response of 1.0 (full bias) will neutralize the value of SAB to chance level (50%). This correction ensures that low levels of SAB are not due to a non-specific effect of response bias toward one side of the maze. The latency to leave the box and the latency to make a choice were also recorded. Supported by NIH grants AA006420, AA020608, DA004398 (OG); MH062962, MH062512 (EM); CA121852, AA021667, HL111566 (AC); and MH090956, MH064376 (PPS). PPS designed the study; VRC, CL, OG, MM, EM, carried out the studies; VRC, CL, OG, MM, GK, AC, EM, PPS wrote the paper. All authors read and approved the final manuscript.